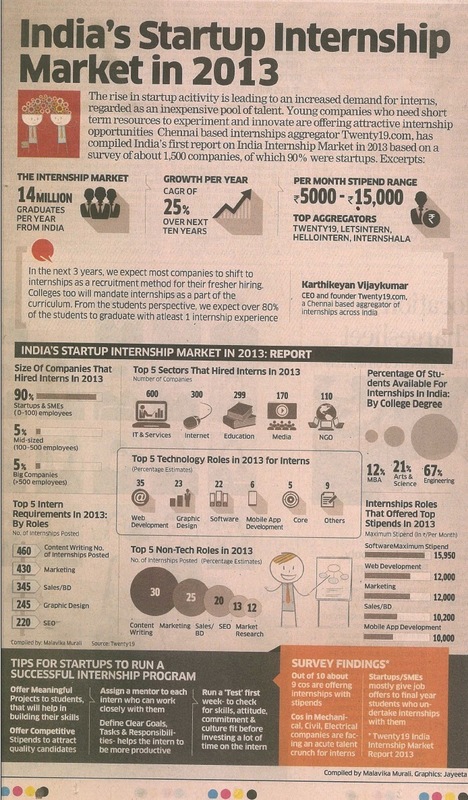 Options in India: As a Recruiter, are you looking for Internship experience? As a Recruiter, are you looking for Internship experience? Before 2012, internship was a choice for a student but now it has turned out to be a eligibility criteria on their fresh resumes. This statement is supported by facts released by a survey conducted by an Indian internship firm, Twenty19. This report reveals a growing trend in hiring interns for temporary and experimental projects where cost is a high quotient determinant. Internships are more like a test drive for students to figure out which roles are most comfortable to them. Objective based internship programs: It really matters if you are bringing an intern on board to evaluate them as a full timer or get some mechanical and operational work done to complete a project. Recruiters need an objective to have an intern on board. Without much value being added to the intern’s experience as well as to the organization, it remains as just another recruitment menace. No matter what the intern’s role is, it needs to be driven by a basic objective of employability, which has been extensively dealt in another article on our blog. The objective for an intern needs to be big. Steven Spielberg started his career in the movie industry as an unpaid full time intern at Universal Studios and now we all watch his movies. Time tested process: Though interns are required for experimental and innovative projects, ensure that you are handing over an intern to a mentor who has already worked with time tested processes. The need or project could be innovative but not the process. Pre-existing supervision and redirection over a process always helps is better resource management. Manual with a Mentor: The survey revealed the need of assigning a mentor to a group of interns and we reiterate the need. Apart from a cohesive job description, operational manuals for the intern’s study during the internship is equally important. These job guides and manuals are to be documented, managed and known by the mentor who would interact with the intern. Do you have this is your agenda? : As mentioned earlier, do you have the objective of absorbing an intern into a full time employee at the end of the project. If yes, then the internship should be designed around HR KPIs for the specific job, you intend to recruit them for. Trends turn into Process: The report reveals top roles for which interns are being hired. Some of them being content writing, marketing, SEO, research, app development and so on. This just shows that companies want to try out the happening trends with interns and eventually establish these trends into value added processes for the organization’s growth. The so called new projects are hence being created upon identifying an industry trend or an unexplored process. It re-emphasizes that, hiring interns is not just about experimenting new processes but about bringing in new, trained talent onboard. Initial screening of interns and creating an employable talent pool enables creation of strong team at the base of the organizational team pyramid. In this era, this recruitment model most helps the companies operating in engineering, mobile app and marketing space. The most promising tenor is about letting interns grow with the expansion of your startup. This can be supported by how Xerox CEO Ursula Burns started out as an intern -- years later she became the first black woman to head a Fortune 500 company.